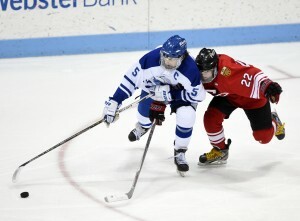 NEW HAVEN – Playing in its third straight Division I championship game, the Darien hockey team vividly remembers the last time it played against Fairfield Prep in the finals two years ago. Despite winning a state title last season over Greenwich and sweeping the Jesuits in the regular season this year, the Blue Wave had one shot to avenge an overtime loss in the title game of two years ago. Seniors Benjamin Brown, Jay Dickson and David Voigt made sure they did not squander the opportunity. Behind a pair of goals by Dickson, three assists from Brown and 17 saves by Voigt, the third-seeded Blue Wave avenged the 2014 championship loss with a 4-2 victory over the ninth-seeded Jesuits in front of a packed house at Ingalls Rink Saturday afternoon. 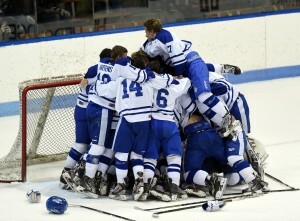 The title is Darien’s second in a row and third overall as the Blue Wave improved to 3-5 in state championship contests. After taking a 2-0 lead into the second period, Darien was ready for a counter punch by the Jesuits in the second period and Fairfield Prep was ready to deliver. Just 2:51 into the middle period, Prep cut the deficit in half when senior Justin Blanchette found himself alone in front of the net to beat Voigt. That was as close as the Jesuits would get as Dickson scored twice in a span of 2:24 to extend the Blue Wave margin to 4-1 with 8:04 remaining in the middle period. Dickson’s first goal came off a scramble in front off an assist from Brown, and his second less than three minutes later, came off a turn around shot in front off assists from Brown and Harry Congdon. “Prep is a team you have to keep putting pressure on,” Dickson said. Making their third straight finals appearance, the Blue Wave made sure to seize control early with a pair of first period goals. Darien looked quicker from the start, scoring just 1:49 into the game and adding another 5:13 later. Darien took a 1-0 lead on the game’s first power play opportunity, needing just 14 seconds to convert. After Fairfield Prep goaltender Jack McGee made an initial stop, Jake Kirby was there for the rebound to the top shelf. The Jesuits, who fell to 16-4 in championship games since 1977, then had their best scoring opportunity of the period with 6:12 gone by as Blanchette broke in on Voigt, but Voigt came out on top with a pad save. Voigt’s save proved to be big as Darien increased the lead to a pair of goals 50 seconds later off another rebound. McGee, who finished with 21 saves, denied Brown, but Sam Knowlton popped in the rebound with 7:58 left in the period. The Jesuits applied the pressure in the third period, but Voigt stood tall, making seven saves to preserve Darien’s championship victory.